We maintain a Buy - Long Term Hold rating on Northrop Grumman heading into Q1 earnings. We believe the company has a good chance of beating revenue consensus estimates, which don't give enough credit to the 2018 acquisition of Orbital ATK. Should a short-term trading opportunity present itself after earnings on April 24, we will post a further note at that time. We initiated coverage of Northrop Grumman (NOC) on February 13 this year. We rated the company a Buy – Long Term Hold. Our Buy thesis was based on the accelerated growth delivered by the Orbital ATK (OA) acquisition which completed in Q2 2018 and which we felt had not been fully included in the valuation. NOC’s $9.2bn EV acquisition of OA, the largest independent business in the space sector, had driven up group revenue growth from +3% p.a. to +5% p.a. on a pro forma basis for FY12/18. The OA business had grown revenue at +17.5% for the year vs. +2.9% for the original NOC business. NOC shares were trading at c.$283/share when we published. We said we were confident in a Buy – Long Term Hold but felt that there might be better opportunities to enter a short-term long trade (because the stock was approaching its 200-day SMA and we felt that might prove a resistance point). This turned out to be so. 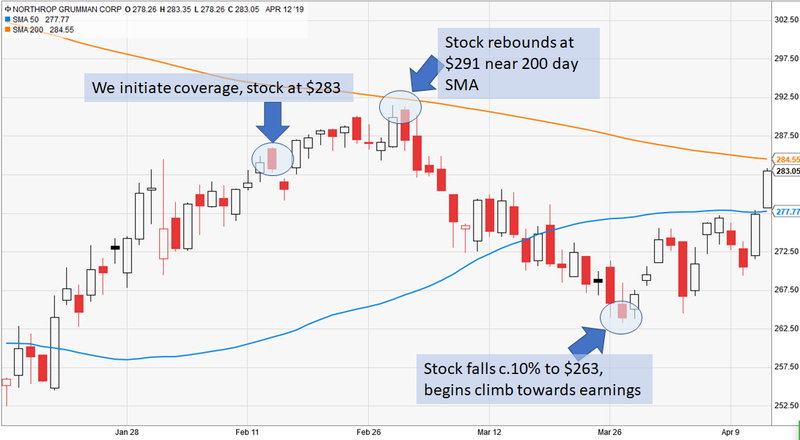 The stock rebounded at $291, just below the 200-day SMA, and promptly fell 10% before beginning a climb in anticipation of Q1 earnings. As we write this note, the stock is again trading at around $283/share. Here’s the chart. We continue to believe in the long term future for NOC and we think it’s a sound long term holding. We maintain our Buy – Long Term Hold rating heading into earnings – we set out our logic for this below. Further, we think the chart above will help us identify a short-term trading opportunity if the stock reacts poorly to earnings. We won’t detail that short-term trading opportunity in this note but we will bring it to our readers’ attention following the earnings release (set for April 24 after the market closes). We think about earnings reports in two ways. Firstly, they give us information about the long-term growth performance of the company. This is typically indicated by the revenue line first and foremost. If revenue is falling or growth is anemic, then over the medium term, earnings will also be weak – even if in the short term earnings growth is strong. Even the best management teams can only cut their way to earnings growth for so long. If revenue growth is strong, then over the medium term, earnings will likely also be strong – because in a well-managed business, operating leverage will deliver earnings growth in excess of the rate of growth of revenues. It is often said that stocks are ultimately valued on a p/e x earnings basis. That’s a little misleading in our view because p/e and earnings are not independent variables. When earnings growth is strong, p/e is high, and when earnings growth is poor, p/e is low. Put simply, the market pays a higher multiple of earnings if the rate of growth of earnings is high. On a quarter to quarter basis, the market’s key measure of earnings, EPS, can swing wildly in any business. It’s affected by tax rates, depreciation charges, asset write downs, integration costs, and all manner of other noises. In our view trying to call the precise EPS on a quarter to quarter basis in a complex acquisitive business like NOC is a very difficult thing to do. Overshot on OA integration costs? EPS down. Undershot on OA integration costs, but took the hit faster than planned? EPS down. Write up in OA fixed assets? EPS up. And so on. So we don’t try to predict the EPS each quarter and we don’t try to identify pre-earnings trading opportunities. In part that’s due to our long-only, equity-only approach. Investors who adopt more complex strategies can no doubt find more ways to make money from earnings days than can we. We’re relaxed about that. Our approach coming up to an earnings date is – do we feel there is any reason why the company will beat its revenue estimates and therefore are we at a long-term Buy or a long-term Neutral going into earnings. Secondly, once the market has reacted to earnings, we may form a view on a short-term trading opportunity (if the stock has over- or under-reacted in our view). Our favorite kind of opportunity is an over-reaction to the downside, where we believe investors can enter a short-term long position in a business we have a long-term Buy rating on, then exit that short-term position if the stock climbs back towards its prior level as the market calms its response. When we see short-term trading opportunities like this, we flag them to our readers. We did this recently for Aerojet Rocketdyne (AJRD) – see our note here >> Earnings-Linked Buy Opportunity In Aerojet-Rocketdyne and Raytheon (RTN) – see our note here - Long Range Growth Opportunity - The Raytheon Company . Happily both ideas worked out well on this occasion. We won’t have a perfect hit rate but we aim to take a relatively low risk approach to identifying these opportunities – we are looking for fat pitches to deliver singles and doubles – we aren’t swinging for the fences. We believe NOC may beat consensus estimates on revenues this quarter for the very simple reason that the consensus number does not appear to factor in the additional growth from the OA acquisition. Coupled with our ongoing confidence in the growth of the company, that means we maintain our Buy – Long Term Hold rating. We make no claims on the earnings front. Because of the OA integration there are so many factors that could push EPS up or down vs. consensus, we aren’t going to try to second guess these. So at this time we make no claims as to trying to place a short term trade prior to earnings (because the market’s short term reaction to the earnings release will typically be driven more by EPS than it will by revenue). We’ll post an earnings review a couple days after the earnings release and deal with the market response to EPS at that time. Revenue Estimates For Q1 2019 Ignore The Benefit of OA? As a reminder we highlight the impact of the OA deal on the growth in FY12/18 vs FY12/17, on a pro-forma basis (ie. as if NOC had owned OA since 1 January 2017 to 31 December 2018). Including the OA deal takes revenue growth from +2.9% to +5.0% on a full year basis through to the end of 2018. But the Q1 revenue consensus – and indeed the FY12/19 consensus - seems to give no credit for the extra growth in OA. The revenue growth rate is back at the core NOC level of +3%. We can’t know everything, but we know of no reason why NOC’s group revenue growth for Q1 2019 vs Q1 2018 should have slowed its growth rate down to the level it was at on a standalone basis before the OA deal. The two key markets in which NOC operates – Defense and Space – continue to grow well. Defense matters are being fuelled by the rise of military posturing and spending in the world, to which the US is obliged to respond – we can thank China and North Korea and Russia for this. The Space segment is driven by the US government’s renewed spending in spaceflight matters (this itself is also of course linked to the rise of defense matters in the world – space projects are both a signal of strength to the US’ opponents, but also have specific purposes which include delivering a military advantage in space) and the ongoing commitment of the US government to include commercial vendors such as OA in their project work. We also don’t know of any NOC-specific issue that would impact revenue growth to this degree. If the Q1 estimate downplays the impact of OA, so too does the full year 2019 estimate which implies a decline in revenue. We think this is set up for NOC to exceed its revenue targets in Q1 and that means we think the shares continue to be a sound Buy – Long Term Hold at these levels. For now we re-iterate our price targets from February (3-year targets of $345/share base case, $399/share bull case and $280/share bear case). These may change once the earnings release is published – we will post a new note at that time. We will follow the Q1 earnings call and report closely and post an Earnings Review note shortly afterwards.